Over the weekend I got to attend a really awesome camp out hosted by Azul Nox Encampment of the OTO along with significant participation and contribution from St. Eve's Parish of the AJC. In the past the camp out was a sort of Gnostic Solar adoration themed camp, as far as I understand it. I was never able to make it in the past, there were always schedule conflicts. But this year, the theme was Bacchanalia and my schedule was miraculously open. Clearly I needed to be there. Dionysos has been a major part of my personal spiritual and magical work for the last several years. The relationship is pretty different from what I've been used to with gods. It's more intimate and pervasive and touches on various areas of interest. It's more directly informative and shaping than others have been, but also more detached in a way and less formal. For years the main visible expression of this, well, aside from several general areas of my life and behavior, has been a Dionysian ritual we celebrate at William Blake Lodge, OTO in Baltimore. The ritual, which is the first of a three part series I call the Thelemic Rite of Dionysos, started out as a a celebration of the vital force understood as Hadit in Thelema. I was asked to put together a ritual for the second day of the Three Days of the Book of the Law, and decided I wanted to work with Dionysos. A few years earlier some friends and I had done a small impromptu invocation of Dionysos as part of a series of study group sessions we called “Crowley, You So Crazy.” We would spend part of the night discussing a Crowley text and part of the night engaging in some sort of practice related to magic or Thelema. So that night wrapped up with a pretty simple ritual to invoke Dionysos. Our host often complained that he had never in any magical work felt any energy or divine or spiritual presences but after we were done this ritual he excitedly expressed how much he felt Dionysos and his influence. A couple years before that ritual was when Dionysos began as a consistent presence on the periphery of my spiritual awareness, one that was consistently edging deeper in, and by the time I had to start planning our Hadit ritual, I was being drawn pretty deeply into his mysteries – which were touching all areas of my magical exploration; and I wanted the people who were going to be there to feel the truly visceral power of Dionysian ecstasy. So I tried to write a ritual and pretty much got no where. Then one night, when I wasn't even working on it, I basically felt like I was being told by Dionysos what should happen in the ritual. So the next day I wrote it, and we did it that year at WBL. It went over really well. That was around April 2011. People asked to do it again, and we expanded it a little and did it again, and people liked it even better. So over the last six years it's been done several times and I've written a second ritual for the series and outlined a third. The more I've done it the more I've found Dionysos inspiring my understanding of various areas of magic and religion. Last December we celebrated the ritual again at Blake as our Winter Solstice Celebration. It was epic. So many people were there. We had a ton of new visitors who hadn't been to anything at WBL before, members brought friends from other groups, old members we don't see often showed up. The previous summer Azul Nox's summer camp had a significantly more Dionysian presence than prior years, and many people involved in Dionysianism through that event made it to ours. Better than the great turn out, people had a great time. With an event like a Bacchanalia it's easy for their to be drama, for people to cross boundaries that they shouldn't cross, or to have people who show up and just didn't realize what they were getting into. We had pretty minimal negatives. We had one of the best post ritual parties I recall us having at a Bacchanal. At one point in the night I said to someone, “If I could create a world, this is what it would be like.” I was pretty satisfied. One very obvious element was that we had the right people, and I was truly grateful to Pankakke, our Pan, and the organizer of things Dionysian at Azul Nox, who arranged so many of the wonderful participants who helped make that night great. It was an important time for us to have something like that at WBL. We had just finished getting through an issue involving an officer and another member which had left some people hurt and upset, and resulted in a couple people leaving. Several people felt that the ritual was working right away to help clear out the negativity and welcome in new life and vitality, which, is very much in line with the intended effect. People have often talked about how Crowley's Rites of Eleusis seem to activate energies which help draw the right people to an OTO body. Several of our officers seemed to feel this was the case with this ritual, as we made new friends, some of whom had unrealized connections with several members. We saw a huge uptick in the community building and networking efforts our Body Master had been working on grow directly in conjunction with this event. We saw some members become more open and present, some of them opening up for the first time at this event. In general there wasn't just a feeling of positivity but an actual visible social fecundity. I also met a new friend, one who I'd previously only known on the internet, and discovered that not only is she pretty awesome, but we have several magical experiences and interests in common. Since the ritual we've gotten to continue discussing and exploring those, which has helped me with several ideas and given me someone who can relate to some of the less commonly discussed things one encounters in magic. That new friend made introductions for William Blake Lodge with several groups, which included connecting us with a trance-possession group I've wanted us to work with for years, and who I think will help introduce us to a sort of spirit work which is not just useful, but is wholly necessary in engaging the mysteries of Dionysos...but also lacking in many with an interest in Dionysianism. This new friend also made a new friend whom she seems to be very happy with, and it sounds like they're bringing good things into each others lives. Our Lodge Master continued this burgeoning Dionysian force and its positive effects with a Lupercalia a few months later which was also well attended and was a great time. Plus, it fulfilled my dream of being one of the Luperci, which I've desired since high school. We had some amazing and joyous things happen at that event, including a proposal. The recipient of the proposal, a man brilliantly aflame with Dionysian fire, also announced that this year's Azul Nox Camp Out would be fully devoted to Dionysos and present another approach to a Bacchanalia. Throughout the months since our last Dionysian rite at WBL several people have told me not just that they enjoyed it, or that they want to do it again, but about how much they feel it has benefited them. We've continued talk about next year's celebration on an ongoing basis, and I think joyously awaiting the summer Bacchanalia at Azul Nox has helped inspire that focus. Several of us from Blake's Bacchic Crew were set to attend and I know I for one couldn't wait to see what was in store. Pankakke is the literal embodiment of everything which is Pan when he takes on the role at the WBL Dionysian ritual, so I was certain his fervor and mad fury would bring about something unquestionably amazing for the summer Bacchic festival, and he did not disappoint, it was amazing. His Dionysos had been crowned as Dionysos ritually the last year, and was in a year long obligation to the Office of the God Who Comes serving to embody Dionysos for the community. He was offered up to us as our alchemical sacrifice for the Winter Bacchanalia, creating a powerful link between what we were doing and what the Dionysians of Azul Nox were doing. Several of their drummers drummed for us in the Winter, and one of their main Maenads was also one of ours. We were ritually blending in a way which I believe helped cement Dionysos's influence and presence into our experiences, we were extending the rite from being a single ritual we performed occasionally to being a current, an agent of the Mysteries, which wasn't just a ritual but was rather a Dionysian community of which that ritual was now a part, and of which other rituals would also be a part. This was the question I was never able to answer before. “How do you have a mystery tradition that isn't just a couple rituals?” Pankakke showed me the answer this year, you have a community of devoted individuals, coming together and networking to create various expressions of the divine mystery; you create a culture. I spent part of my time in anticipation of the Bacchic camp out anticipating new inspirations from engaging Dionysos in a new way. The third ritual for my mystery system is not yet written, and celebrating rituals one and two seemed the best way to stir the Dionysian presence to inspire me, but as I realized this camp out would occur, I realized it would also be able to inspire and teach me. And it did. I had so many amazing experiences of Dionysos during this camp out, in both ritual time and in more relaxed playful times. Since then I've seen more connections and had more inspiration for ways to continue this development. Not only have I had that benefit of being inspired by seeing what others were doing, and seeing what a large group of Dionysians Pankakke was able to call together, but I learned that our works have been somewhat symbiotic in that our Winter Celebration helped inspire and stir communication with Dionysos that impacted the development of the Summer Celebration, just as working with the previous years summer celebrants and anticipating this summer celebration has impacted the current at Blake. Aside from mystical inspiration I gained some personal clarity this weekend, having spent a fair amount of it away from revelry and focused more quietly on that same person I was drawn to in the Winter, and in a wine soaked night finally gained the clarity we'd previously been missing. And, while I almost didn't post this post because that same clarity went away just after I wrote it, the time during the weekend is still something I'm thankful to Dionysos for, and I trust that in the end, things will be right, and if Dionysos wishes to give live to this he will continue to stir us with his presence, and if not, then we'll find music that guides our dances elsewhere. And more importantly, I know it was a transformative weekend for others who were there, some finding happiness after struggles, some gaining needed breaks from difficulty and reconnecting to themselves and past happinesses, some reaping rewards for previous hard work, and some just being moved by mystical experiences they weren't otherwise expecting. I have seen so many Facebook posts praising the weekend. I applaud and appreciate the work Pankakke has done, and I am super happy I got to attend this year's camp out and hope to attend future ones. I fully encourage any readers who are able to be in Baltimore when we engage in our Dionysian rites, or in PA for the summer camp out to make every effort to attend these if you're at all called to the transformative and vivifying power of Dionysos. I look forward to future work with the other Dionysians of our growing community. If your experience of spirit work is in a primarily European context, and you maybe get a little Orphic with the Hymns, but not so rhapsodic as to fully get down with the Orphic mysteries inherent in Dionysos, then maybe exploring this as an entry to more visceral and intimate spirit work might be for you. But maybe not. There's definite power there. Dionysos comes, and he brings with him force, motion, life itself. He draws us to the dance which is existence and inspires us to touch divinity unbridled as it courses its way through us, moving us, questioning us, and teaching us. He is a God of many gifts, and they manifest on many levels. Changes in the world around us, in our social connections, in our perceptions of ourselves and others, in our ability to bring mystery to the world, in our ability to experience ourselves and the divine. We can drink deeply of him, and intimately know him, but he is essentially the force behind the live wire. Be ready to move with that force, be ready to maybe get burned a bit by that force, but dance with it, and find what it offers you through the madness and freedom it brings. 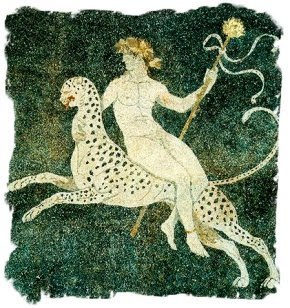 Also...I hear rumors about live leopards and NPH in the future of the Dionysian mysteries...?